I made this a while ago and can't believe it's taken me this long to post it b/c it was SOOO yummy! I love a good salad and this was different from most I've tried recently. I loved the crispy wontons with the pasta and the nuts. All those different crunchy textures really made this scrumptious! 1. Heat canola or corn oil in a skillet over medium-high heat. When oil starts to shimmer, fry wonton skins in batches of 5-7 strips for 30 seconds each side or until lightly browned, working quickly so they don’t burn. Remove from oil and drain on paper towels until cooled. 2. In a large bowl, combine lettuce, chicken breast, green onion, almonds and pasta. 3. Combine dressing ingredients in a small bowl. Whisk well until sugar dissolves. 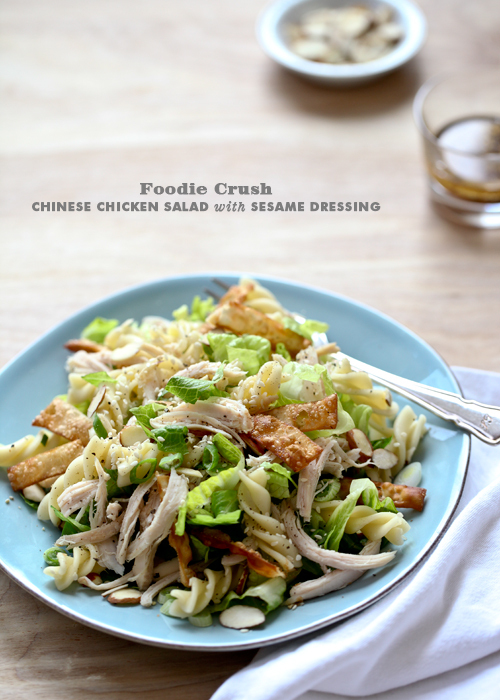 Dress lettuce mixture with 2-3 tablespoons of sesame dressing and top with sesame seeds and wonton strips and serve.